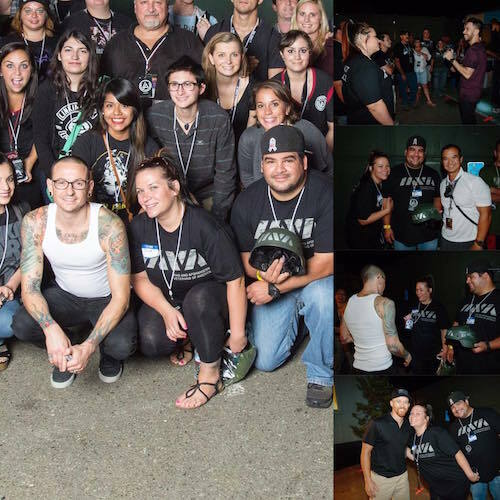 I’ve never been good at putting things into words, but thanks to you, Quan Nguyen and IAVA, my wife and I had the opportunity to meet Mike, Chester, Joe, Phoenix, Rob and Brad at the show in Wheatland Ca back on this same night in September of 2014. By far my favorite band ever, to me these guys were the equivalent of what Creedence Clearwater Revival was to Vietnam. I remember crossing the Kuwait/Iraq border blasting Crawling in my M984 Wrecker. As star struck as I was, these guys were the coolest must humblest people I have ever met. Chester’s passing was a gut shot to my generation and to the world, but his legacy will live on in his songs and through his brothers who will take the stage in October without him physically being there, but he will be there in spirit as every word and note of every song is played. The Hollywood Bowl is going to rock like its never rocked before. What a night it will be.